It's a favorite fact included on countless lists of trivia about The Queen: Her Majesty owns all the swans in the country! More accurately stated, the Crown has rights of ownership of all unmarked mute swans in open water, a right only exercised on certain parts of the Thames and its tributaries. The Queen's Swan Marker leads the annual Swan Upping ceremony to conduct a census of the swans on sections of the Thames. 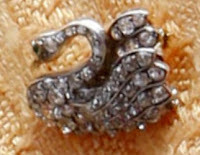 When The Queen came along to watch the Swan Upping in person in 2009, she had just the brooch for the occasion: a small diamond swan of unknown provenance. 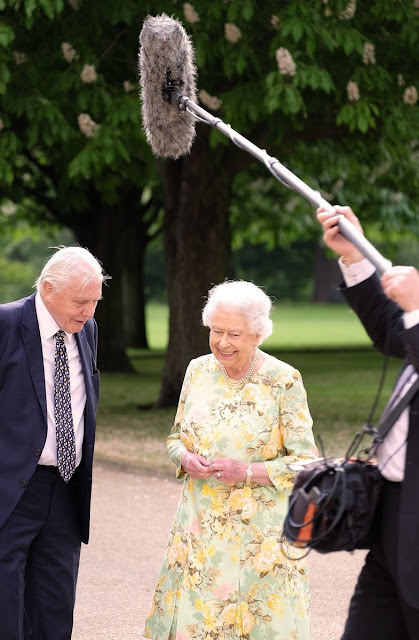 Given the Crown's well-known and centuries-long association with swans, as well as the sheer size of The Queen's collection, I find it unsurprising that such a gem exists in the royal vault. Her Majesty has at least one other swan jewel, the Double Swan Brooch, debuted in 2014. Following its usage at the 2009 Swan Upping, the Diamond Swan Brooch was worn for an appearance with Sir David Attenborough recorded for an upcoming 2018 documentary on The Queen's Commonwealth Canopy forest conservation initiative, another fitting occasion for a nature brooch. A photo of the two was released today (above).